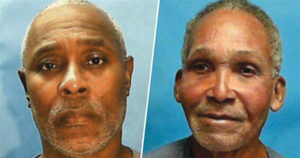 JACKSONVILLE, FL — Two elderly Black men, 76-year-old Clifford Williams and his nephew 61-year-old Hubert “Nathan” Myers, are finally free from prison 43 years after they were convicted of a murder they never committed. Williams and Myers, who were then at the age of 33 and 18 respectively, were sentenced to life in prison for the 1976 murder of Jeanette Williams and the attempted murder of her girlfriend, Nina Marshall. According to reports, the two women were shot while they were in bed sleeping. Marshall identified them as the shooters although she gave rather inconsistent testimonies. Marshall testified there were two shooters each holding a gun inside at the foot of her bed. However, there were bullet holes in the window screen and the curtains, indicating the shooter was from the outside. Also, the ballistic tests determined the bullet used on the crime came only from one-gun, disproving Marshall’s claim that there were two shooters. Moreover, Williams and Myers strongly denied the accusations, saying they were at a birthday party down the street from the shooting at the time it happened. Other people who were at the party could have confirmed they were at the event, but they were not called as witnesses. The two men’s lawyer did not provide any defense during their two-day trial. Not even the discrepancies in the story of Marshall were considered in the case. Both men have maintained their innocence throughout. Myers, who had just recently graduated from high school then, was even offered a plea deal if he testified against his uncle but he refused. Myers, who read about wrongful state convictions in Florida while in prison, wrote a letter to the Innocence Project Florida. Through that, he shared his and his uncle’s story together with an affidavit from another person who claimed Nathaniel Lawson, who died in 1994, confessed to the murder. Eventually, the Conviction Integrity Review unit released a 77-page report on their case, including all the evidence that was initially never provided to a jury. Myers is eligible for compensation, as the state of Florida stipulates that people can receive $50,000 for every year they were wrongfully convicted, although there is a $2,000,000 cap. Williams, since he had two prior felonies, is not eligible for compensation. “I lost almost 43 years of my life that I can never get back, but I am looking ahead and will focus on enjoying my freedom with my family,” Myers said in a statement released by the State’s Attorney’s Office.